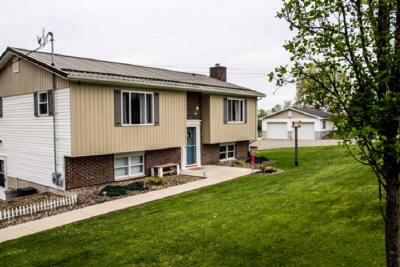 Lovely, move in condition, split level home minutes from town & all amenities. Home boasts several living areas with family & den in basement. Eat in kitchen with custom oak cabinets & tile.Three bedrooms on first level one is being used as a formal dining room. Nice size 4th bedroom on lower level. Stone hearth set up for wood or pellet stove. Lots of storage with 18 closets ! Newer double pane, vinyl windows let in the light and keep utilities low. Metal 40 year roof. Detached two car 24 x 30 garage.